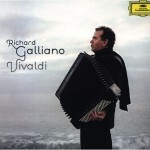 Richard Galliano studied piano and accordion at the age of 4 with his father Lucien Galliano, accordionist and teacher. and followed courses in harmony, counterpoint and trombone. He won first prize in 1969 for this instrument. 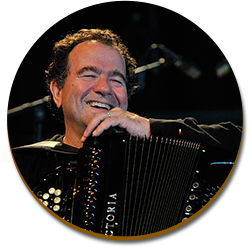 He arrived in Paris in 1975 and met Claude Nougaro, becoming his friend, his accordionist and conductor until 1983. The author and composer found each other. They get along beautifully. The second decisive meeting took place in 1980, with the Argentinean composer and bandoneonist Astor Piazzolla. previously invented the Argentinean “New Tango”. 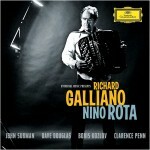 During his long and prolific career, Richard Galliano recorded more than 50 albums under his name. Gary Burton, Michel Portal, Toots Thielemans, Kurt Elling, for jazz. Serge Gainsbourg, for French song. Nigel Kennedy for the classical repertoire and a large number of orchestras. 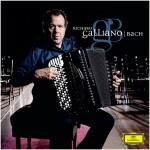 In 1997 Richard Galliano was awarded a “Victoire de la Musique Jazz” for his album New York Tango. He was again in 1998 for a new album Blow Up, recorded in duo with Michel Portal. In 2009, he was appointed Officer in the Order of Arts and Letters. which he and his father Lucien Galliano, at the Lemoine Publishing House, realized. records of classic sales and exceeds 70,000 copies sold.  He is named Commander of the Order of Arts and Letters in 2011.  He won the “Victoire de la Musique Classique” in 2014 and also received the “Best Composer of the Year 2014 Award”. album in 2016, this time dedicated to the work of Wolfgang Amadeus Mozart. Ponderosa music&art, thirty years after the album Spleen, which introduced in 1985 the musical concept called New Jazz Musette.  In 2016 he was promoted to Officer of the National Order of Merit by the President of the Republic François Hollande.